My aim is to explain the idea that social practices are the basis of all that humans know and what can be known. - There is no other intelligence, knowledge, than that which is in our traditions, social practices passed on from people to people, generation to generation, through the medium of language, by language, in language. Social sciences and philosophy, all the distinctly human - the fundamentals of cognition and human society are but reflections of the social practices, of what people do and have done. Those who accept these ideas would find themselves compelled to reject a great deal, if not most, of the doctrines of the universities of today. 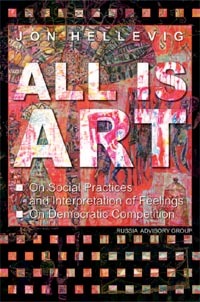 - My book All Is Art is intended as a summary of these ideas, in short it is about human knowledge, and the other side of the coin: human ignorance. Both these are functions of individual interpretations of feelings and language that represent social practices. Speech, interpretation of feelings. One has to move beyond language to see that the philosophical problems disappear - and beyond language we have feelings, which are given an interpretation in speech. Scientifically feelings are connected with psychological, and biological problems, or whatever we want to call them, but certainly not philosophical ones. 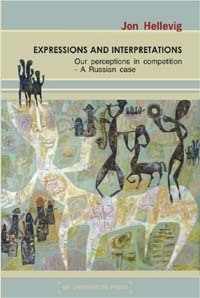 Speech (of which language is a reflection in form of social practices) only delivers the expressions of feelings, the expressions of the interpretations of them; language creates the different perceptions on life that affect feelings, and the feelings that affect perceptions on life; understanding this we should now be able to realize that the 'true workings of language' consists of interpretations of feelings, and hereby there are no intrinsic rules or anything of the kind we could refer to or that would guide the process, there is but an endless competition between all the infinite variances of perceptions that people form under the influence of feelings. With language we can only roll from one interpretation to another, and there are no truths to be reached on the road; instead it is better to see language as a method. It is basically a market method or a competitive method, an open system where all language use affects all other use. Therefore in proper philosophy there are no rules, no laws that we could discover and explain, and thus all that we can do in terms of philosophy is merely point out when words are arranged so that nonsense follows and confusion reigns. Interpretation of feelings. Interpretation of feelings has a biological foundation, it is the biological struggle occurring in the binary mode of pain and pleasure. Gradually, in the course of evolution, this struggle has been brought to the mental level, up to language. - - - We humans lack experience, training, to express ourselves, to express opinions, express feelings. The human heritage is still so poor, so weak; forms of life, the stage settings have altered, we dress as if we were modern men, but our language, the language of things, is still back in the stone ages; I doubt that we could today express the mental any better than people could those thousands of years ago - maybe the other way around. We have the language of things, stone, copper and bronze, we need to melt this language, make it fluid, cast it in the mode of feelings, those infinite variances. We need a new grammar for interpreting life, the beginning, the eternal, the infinite - and love. With the idea of interpretation of feelings we connect the mental (abstract) with the natural reality, the thingly core of cognition - The thingly core is the body that produces the feelings. - I stress: the expressions of the feelings that we hear and see are only feeble copies, faint interpretations of the original, the inner. - There, in the body nature produces the social, the human - the human: these expressions, the language which is the human. - Nature produces language. From this statement it is evident that the core of cognition, the limits of what can be known, lies in a contradiction in terms. For expressions are not things (which I stress time after time), expressions are not material, they never existed, not even when they 'were produced'. - This is what we need to explore: to establish this connection between the mental (non-existent expressions) and the biological organism (the biological surroundings where and the physical actions from where the mental originate). This is our challenge: to acquire a grammar and a vocabulary to speak of the mental, the non-physical, feelings, the infinite and the eternal. Expressions come out through physical means, but they themselves are not physical. The expression is an interpretation of feelings. This is the dilemma which prevents us humans to understand the universal, the beginning and the end. - What we cannot touch, thereof we have to speak - in the language of art. Social practices. All human, all aspects of human life are governed by, and reflected in social practices, in people's lives in the commonwealth. What is considered good, and what is considered bad, is exclusively a function of social practices. Social practices is what people do together and all knowledge, all ideas, all science is but a reflection of these practices. These practices are carried in language, which is the supreme manifestation of all social practices. Language comes about through the efforts of one and many individuals - all of us - expressing feelings, exploring the possibilities to express the feelings, opinions, to be understood. Social practices and interplay of feelings. This idea of combining social practices with the eternal interplay of personal expressions and interpretations contrasts markedly with the way the need to explain life and knowledge has been addressed throughout history. In the earliest times, it seems, that explanations were sought for in external forces: trees, plants, and animals were credited with powers to direct human faith, life on earth, the universe. Mountains, lakes, seas, landmarks in nature were assigned these powers; the sun and stars, celestial bodies, were assigned this divine role. Later special entities, human-like gods, were attributed these powers. Such beliefs followed naturally from practical thinking, practical human logic in contemplating the world, reasoning from what could be known, from what could possibly be known with the means then available. - I believe that traditional beliefs build on the idea that these external forces, deities, were in some way reflections of the human self. In this sense, it seems, humans back in those times ultimately thought - as I do now - of the world as a projection of the self (the Ego) to the universe, which is like interpreting the universe from point of view of personal feelings. - The idea of interpretation of feelings as the paradigm might therefore represent this same eternal and ultimate idea. We merely return to this idea after clearing away the debris, the building blocks of social science fiction, two thousand years of wrong questions. From underneath the layers of misconceived philosophical problems; misconceptions; linguistic confusion and delusion we return to the eternal, the mysterious, what we cannot know - The cardinal mistake which led to the social sciences of the 20th century was the mingling into one bundle the conception of the material nature (natural sciences) and the mental and spiritual (what we today call social sciences, philosophy, and religion). And while on that, even worse, taking the flawed understanding of the natural sciences as the paramount knowledge, starting to think that all that is the case is something thingly, and that every thing is a thing-in-itself. Merger of the external and the internal explanations. With this understanding of language as interpretation of feelings and knowledge as social practices we have closed the loop between the two extremes by which humans have sought to explain what governs life on earth: the beliefs in external suprahuman agents and the belief in an internal agent. 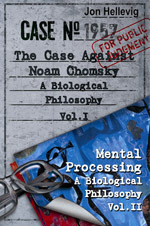 Thus this philosophy of social practices and interpretation of feelings is a merger between the two opposed ways of contemplating life: those ideas from the beginning of time, those ideas of the external forces, the deities, which conduct life and portion out knowledge - and - the ideas of seeking an internal origin for knowledge: 'the soul', 'the mind', 'the reason', these words originally describing human faculties, innate capabilities and powers to think and act as a human, but converted in the perversion of scientific thinking to connote a kind of an entity purported to reside inside the body but separate from it; like 'the soul' that can take leave from the body at death - and sometimes earlier than that - and migrate into another body; or 'the reason' located inside the human brain, hailed like a thing, a physical organ, but never seen by anybody. But by now, with this new philosophy, we may appreciate that the internal was not the 'reason' 'the mind', 'nor the soul' - nothing of the sort that can be grasped with a linguistic analogy to the nature - but the biological process that was set in motion through the binary struggle between pain and pleasure, the penultimate manifestation of the process which are feelings. These are the feelings that, the creative man, homo artisticus is dying to express. We now see that the external forces were but reflections, the condensed ideas of the eternal interplay between all expressions and all interpretations. We have understood that these expressions and interpretations form traditions, social practices, in which we determine what is good and what is bad, what is to be treated as knowledge what is to be rejected as such. And we have understood that the supreme form of the external is language, language reflecting the current balance between all social practices. - And we have understood that language, this supreme form of the external, simultaneously is the supreme form of the internal, the ultimate manifestation of the internal, the expression for feelings (a language of thingly words which are, as of now, mere feeble imitations, faint reverberations of what we all have to say). Thus language is what connects one individual with others, the internal with the external, feelings with expressions, and forms a human out of biological flesh and bone. - We have understood that the external and the internal are in constant association where the one feeds the other. And we see that there is nothing more to human society than this. We see that that knowledge is not a faculty inside the human, and nothing administered from the outside, but simply a reflection of human efforts - human, all too human. In All Is Art I want to spell out my conviction that all human life in society is based on social practices i.e. traditions carried on from person to person, from generation to generation. - And hereby I stress that all human life can only be life in society; human life stems from life in society, and no life can be sustained outside of society. I have a goalвЂ¦I wish to help to bring about a fundamental change in how to perceive knowledge, science, and human cognition, the basis of human commonwealth, of humanity. I claim that all what humans have achieved - or what they wish, or what they think that they have achieved - is all based on social practices, and nothing more; social practices are the achievements, and nothing more can be achieved - and therefore: all is art!.